The dispute between Hay'at Tahrir al-Sham (HTS) and al-Qaeda loyalists in Syria continues, with a longstanding point of contention being weapons held by HTS and claimed by the group of al-Qaeda loyalists under the leadership of Abu Humam al-Shami (Hurras al-Din). In this context, al-Zubeir al-Ghazi, a leader in HTS and a key defender of the HTS project alongside Abu Abdullah al-Shami, has weighed in. He argues that the Hurras al-Din group has no claim to the weapons in HTS' possession, as Sheikh Abu al-Khayr al-Masri (a 'deputy' and designated 'successor' of al-Qaeda leader Ayman al-Zawahiri who came to Syria and was subsequently killed) had ruled that they should remain under HTS' disposition. Abu Humam al-Shami had apparently accepted this point in an agreement he struck with HTS leader Abu Muhammad al-Jowlani at the beginning of January 2018. However, Abu Humam al-Shami's group rejected the agreement. In any case, argues al-Zubeir al-Ghazi, the weapons claimed by Abu Humam al-Shami's group have been expended in a variety of battles such as Aleppo and Sharq al-Sikka, the latter of which lasted some 4.5 months and resulted in the loss of more than 700 fighters for HTS according to Jowlani. A certain 'Abu Mus'ab al-Suri', identified as a former member of al-Qaeda affiliate Jabhat al-Nusra that eventually morphed into HTS, has issued a response to al-Zubeir al-Ghazi. This Abu Mus'ab al-Suri should not be confused with the well-known jihadi ideologue of the same name. Abu Mus'ab argues that al-Zubeir al-Ghazi has been misleading on multiple counts. 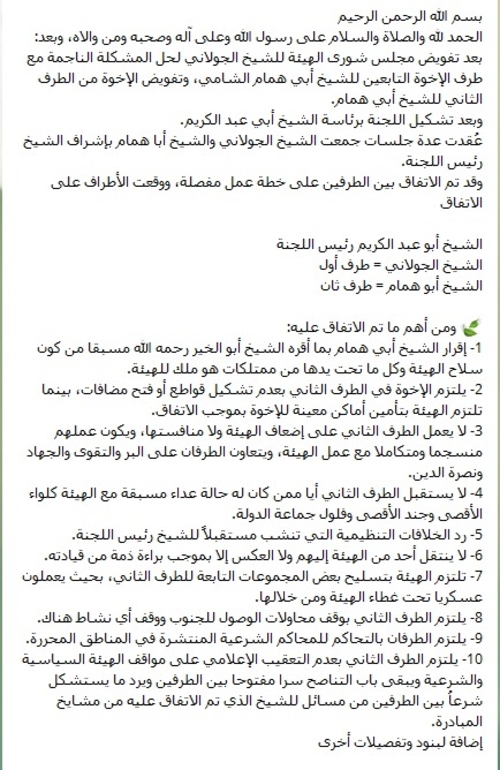 For example, while al-Zubeir al-Ghazi portrays the rebranding of Jabhat al-Nusra to Jabhat Fatah al-Sham as the breaking of ties with al-Qaeda blessed by Sheikh Abu al-Khayr, Abu Mus'ab says that this is misleading because that transition was actually a switching of the allegiance with al-Qaeda from public to secret. 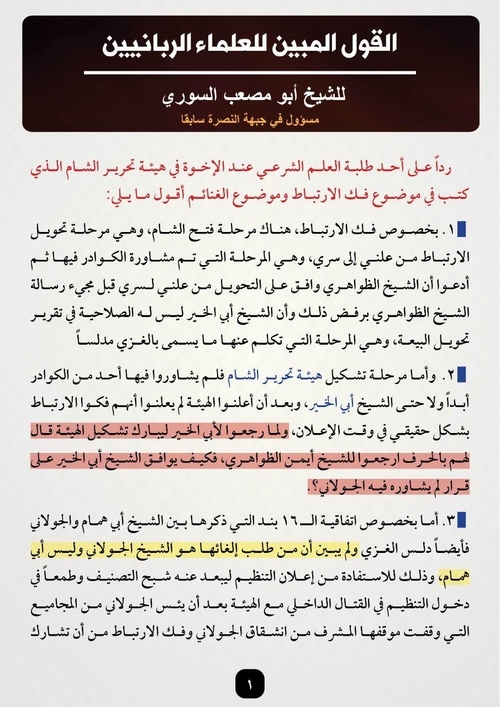 In this regard, the evidence of other testimonies on both sides tells against al-Zubeir al-Ghazi: the testimonies of Zawahiri, Abu Abdullah al-Shami and al-Qaeda loyalist Sami al-Oraidi all show that Jabhat Fatah al-Sham was meant to have a secret allegiance to al-Qaeda- something that Zawahiri rejected. 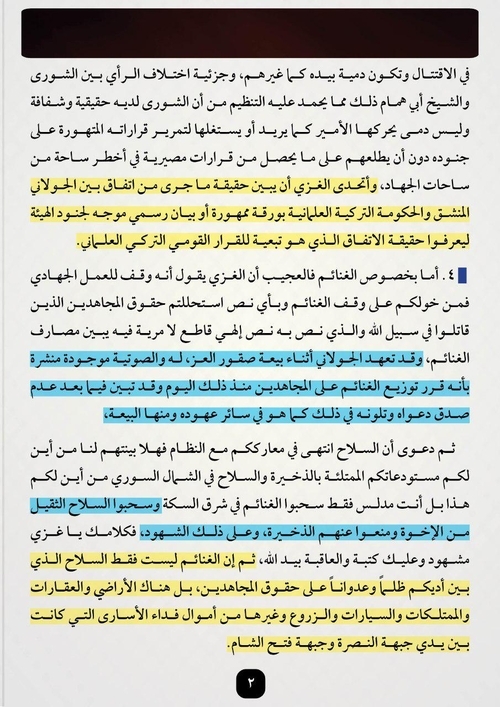 In addition, Abu Mus'ab argues that there was no appropriate consultation on the formation of HTS, and Abu al-Khayr al-Masri did not give his blessing to its formation but rather said the matter would have to be referred back to Zawahiri. Abu Mus'ab does, however, concede that Abu Humam's group rejected the agreement he struck with Jowlani, but says this is actually commendable as it shows that the group's Shura (consultation) mechanism is not merely some puppet in the hands of the leader. 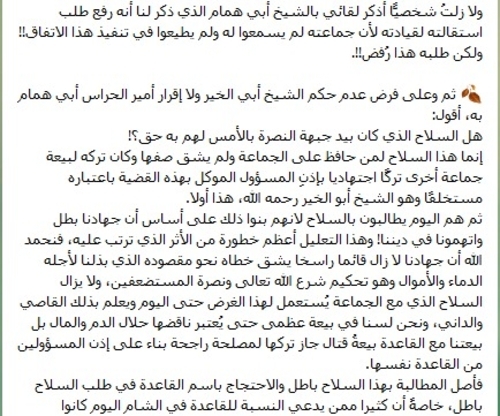 Even so, Abu Mus'ab argues that it was Jowlani and not Abu Humam who demanded for the agreement to be cancelled. Finally, Abu Mus'ab argues that al-Zubeir al-Ghazi's portrait of the weapons in question as having been expended in battles is misleading. Of particular interest in this dispute are the terms of the agreement struck between Jowlani and Abu Humam. Though the agreement does recognize HTS' position of strength that is not to be challenged by Abu Humam's group, the agreement does stipulate cooperation between the two sides, including arming of some contingents of Abu Humam's group by HTS. Those contingents are then to work under the cover and supervision of HTS. Even now, some evidence suggests that there is HTS supervision of some ribat (frontline) points manned by Hurras al-Din, with HTS being responsible for provisions for those points. Indeed, it is impossible for Hurras al-Din to engage in any military operations without HTS' knowledge of it. A further issue in the agreement revealed by al-Zubeir al-Ghazi is the question of southern Syria, as Abu Humam's group was barred from trying to go to the south and engaging in activity there. At the time the agreement was struck, the south still had an active insurgency but no presence for Abu Humam's group. Abu Julaybib (a Jordanian al-Qaeda loyalist), who had been a key official in Jabhat al-Nusra in the south was transferred north prior to Jabhat al-Nusra's rebranding, had tried to go to Deraa but was stopped by HTS- an issue that had been mentioned in the round of testimonies that emerged in late 2017. More recently, Abu Julaybib was killed in an apparent attempt to revive the insurgency in the south. In short, while we should take note of the disputes between Hay'at Tahrir al-Sham and Hurras al-Din, we should also not pose a dichotomy of total hostility between the two sides akin to e.g. the relationship between these groups and the Islamic State, which considers them to be apostate organizations that must be fought. Below is my translation of the testimonies in full. Any insertions in square brackets are my own. Does the Hurras [al-Din] group have rights and arms with Hay'at Tahrir al-Sham? Before Jabhat al-Nusra broke ties with al-Qa'ida there came to the blessed field of al-Sham a mujahid man from the veterans of the mashayakh of the jihad, and he is the mujahid sheikh Abu al-Khayr al-Masri (Ahmad Hassan)- may God have mercy on him- in his capacity as a deputy for Sheikh Zawahiri and a successor for him (as we will publish in the following documents- attachment no. 1- which establish the succession of Sheikh Abu al-Khayr). And he came out in his famous audio message that permitted Jabhat al-Nusra to break its ties implementing what it sees as in the interest of Islam and it is what was. And after the disagreement between Jabhat Fatah al-Sham- then Hay'at Tahrir al-Sham- and some of the brothers who defected from it on the grounds that they were remaining with al-Qaeda then going back to Sheikh Abu al-Khayr al-Masri again: he ruled then that what was in the hands of the commission [Hay'at Tahrir al-Sham] from weapons would be for it and would remain under its disposition, and in this regard he wrote a book a copy of which is kept by the leadership. It has the disposition to judge whether to publish it or not. And during the battle of Sharq al-Sikka meetings occurred between Sheikh Abu Muhammad al-Jowlani and Sheikh Abu Humam al-Suri, and this was before the announcement of Hurras al-Din of this name of theirs even as they were actually gathered together under a single framework and awaiting the opportunity of announcement. And all thought that to be that they exploited the attack of the factions against the commission after it was exhausted in the battle of Sharq al-Sikka, so they announced Hurras at the time of the fighting with the factions. A document of agreement of 16 clauses of which we place the most important in the following sharing (attachment no. 2), and the summation of these clauses was that the issue of the weapons would be on the basis of what Sheikh Abu al-Khayr al-Masri (may God accept him) ruled or judged, as the two groups had accepted it in ruling back then. And when Abu Humam took the agreement to his companions, they rejected it. So he came to the commission group and said: I have not been able to oblige my group by it! And I still personally remember my meeting with Sheikh Abu Humam who mentioned to me that he raised his resignation request to his leadership because his group did not listen to him or obey in implementing this agreement!! But this request of his was rejected!! Do they have a right to these arms that were in the hands of Jabhat al-Nusra yesterday?! These arms are for whosoever has preserved the group and not split its ranks and its abandonment of allegiance to another group was an abandonment of ijtihad by the permission of the official entrusted with this case in view of the fact he was a successor, and that is Sheikh Abu al-Khayr (may God have mercy on him). This is the first point. Second, they are today demanding weapons because they have built that on the basis that out jihad is false and they have accused us in our religion! And this justification is more dangerous than the consequence it has entailed. For we praise God that our jihad remains established and implanted, making its steps towards its intention for whose sake we have expended the blood and wealth and that is implementing the ruling of the law of God Almighty and supporting the oppressed, and the arms that are with the group are still used for this purpose until today, and the one near and far know that. And we are not in a greater allegiance pledge such that its annulment is to be considered making blood and wealth fair game but rather our allegiance pledge with al-Qaeda is an allegiance pledge of fighting that it has been permitted to abandon for a greater interest according to the permission of the officials from al-Qaeda itself. So the principle of demanding these weapons is false and asserting proof in the name of al-Qaeda in demanding the weapons is false, especially as many of those who claim affiliation to al-Qaeda in al-Sham today were adversaries to us when we were Qaeda! So the strange thing is how one who did not join al-Qaeda when it was Jabhat al-Nusra and has joined it today in another name has been demanding rights he did not contribute to building in the first place?!! Then what has remained from these arms after more than 2.5 years since the breaking of the ties and the very great battles that Jabhat Fatah al-Sham then Hay'at Tahrir al-Sham waged in which it used up its storehouses entirely like the great battle of Aleppo, then the second battle of Hama, then Sharq al-Sikka etc.. Has anything really remained from these arms until today?!! So our brothers think that out arms remain confined to warehouses?! No, by God. This is not and will not be what we do. Rather our arms bear witness to the warehouses that include them that when the flame of war alights, they all come out to be in the frontlines of which nothing is concealed. Indeed those arms have all been expended in the path of God, and spent in their places. Is what has been granted as endowment in the path of God then spent in its places to be considered after it has been expended in its places?! Even if we were to concede that there is a true dispute on the question of to whom the weapons belong, we do not concede that issue in principle. 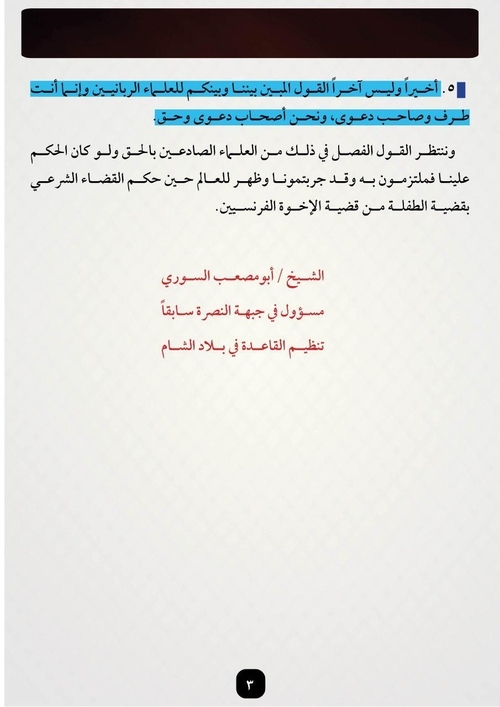 Then after this agreement was signed we were informed of its annulment by our brothers the Hurras group- regrettably- and so Sheikh Abu Abdullah al-Shami- Abd al-Rahim Atoun- wrote his article: "Al-Bay'an bil-Khayar Ma lam Yaftariqa." This was published while we were preoccupied with resisting the attacks of the regime and the Khawarij [Islamic State] of Sharq al-Sikka. At the same time some were eager to broadcast false rumours and make the mujahideen abandon the fighting of Sharq al-Siqqa, sometimes on the pretext that the battle was political, and sometimes on the basis that it was incinerating the monotheists, as well as other false rumours. And now they today want to seize our arms in a picture that resembles to a great extent the Fatwa al-Zhafr that was issued by al-Anbari on that day to legitimize the seizure of the properties of the mujahideen, then on the basis that they have the Jabha [Jabhat al-Nusra] in the time of its establishment a portion of money! We ask God for that accursed mistake not to be repeated. See the message entirely within attachment no. 3. Oh God, show us the truth in truth and grant us to follow it and show us the falsehood in falsehood and grant us to avoid it. And God is the guarantor of success. 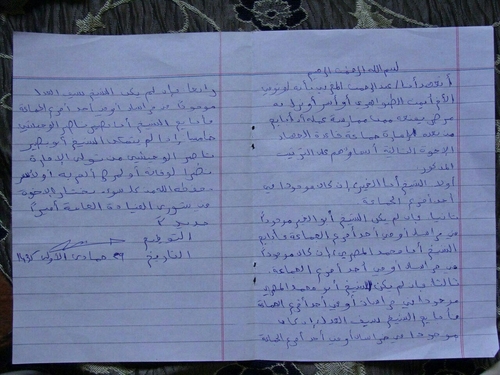 Documentation of some of the messages in the handwriting of members in the al-Qaeda Majlis Shura proving that Sheikh Abu al-Khayr is the first deputy for Sheikh Zawahiri (may God protect him). 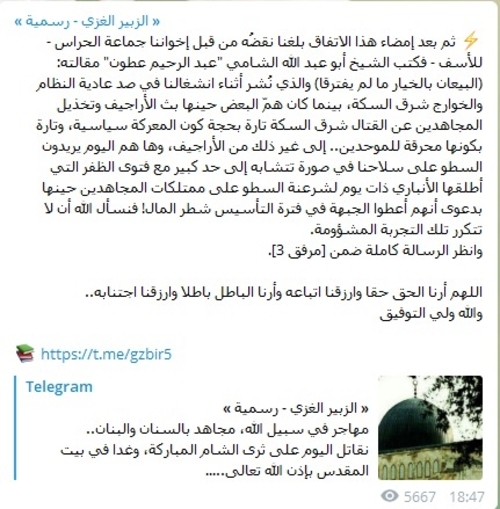 The last message that reached Jabhat al-Nusra from Sheikh Zawahiri at the end of 2013, three years before the announcement of Fatah al-Sham: in that message it came that Sheikh Abu al-Khayr- may God accept him- is first successor' in the event of Sheikh Ayman's absence, and that Sheikh Abu Muhammad al-Masri is the second successor, and that Sheikh Sayf al-Adel is the third successor. Then Sheikh al-Wuhayshi is fourth successor. And among what the message contained is that since the three successors are not in one of the fields, the successor should be Sheikh al-Wuhayshi (the attached messages). And Sheikh Ayman mentioned that he would be absent for a time from contact for his security circumstances, and he advised to enter into the Islamic Front [Syrian rebel coalition formed in late 2013] and track the matter of the Khawarij with Sheikh Abu Baseer [Nasir al-Wuhayshi, the deceased leader of al-Qaeda in the Arabian Peninsula]. Since that time and all the branches of al-Qaeda know that Sheikh Abu Baseer- may God accept him- was deputy to Sheikh Ayman, and practiced his competencies entirely because of the absence of Sheikh Ayman, and all who lived through the fighting of the Khawarij know that Sheikh Abu Baseer was deputy of Sheikh Ayman, and that was so until he was killed, so after that the position of deputy became vacant. - During that time Sheikh Abu al-Khayr came to us and became part of the al-Sham branch so he became a deputy in that. [following are documents for attachment no. 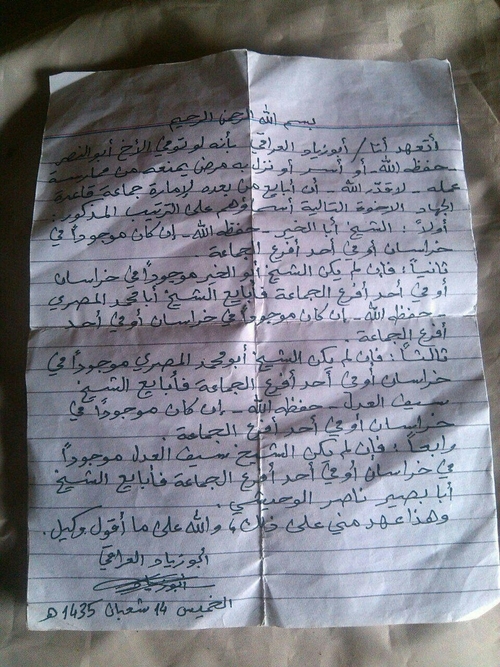 1, intending to prove the line of succession in al-Qaeda should Zawahiri die, be taken prison or become incapacitated]. 1. Sheikh Abu al-Khayr if he is present in Khorasan [Afghanistan/Pakistan region] or one of the branches of the group. 2. If Sheikh Abu al-Khayr is not present in Khorasan or one of the branches of the group, I pledge allegiance to Sheikh Abu Muhammad al-Masri if he is present in Khorasan or one of the branches of the group. 3. If Sheikh Abu Muhammad al-Masri is not present in Khorasan or one of the branches of the group, I pledge allegiance to Sheikh Sayf al-Adel if he is present in Khorasan or one of the branches of the group. 4. If Sheikh Sayf al-Adel is not present in Khorasan or one of the branches of the group, I pledge allegiance to Abu Baseer Nasir al-Wuhayshi. 5. If Sheikh Abu Baseer Nasir al-Wuhayshi cannot assume the amirship in view of death or an illness that befalls him or imprisonment- may God protect him from every evil- the brothers in the Shura of the general command are to choose a new amir. And this is a pledge from me upon that. And God is trustee over what I say. 1. Sheikh Abu al-Khayr if he is present in Khorasan or one of the branches of the group. 5. If Sheikh Nasir al-Wuhayshi cannot assume the amirship in view of death or an illness that befalls him or imprisonment- may God protect him from every evil- the brothers in the Shura of the general command are to choose a new amir. And God is witness over what I say. 1. Sheikh Abu al-Khayr if he is present in one of the branches of the group. 1. Sheikh Abu al-Khayr (may God protect him) if he is present in Khorasan or one of the branches of the group. 2. If Sheikh Abu al-Khayr is not present in Khorasan or one of the branches of the group, I pledge allegiance to Sheikh Abu Muhammad al-Masri (may God protect him) if he is present in Khorasan or one of the branches of the group. 3. If Sheikh Abu Muhammad al-Masri is not present in Khorasan or one of the branches of the group, I pledge allegiance to Sheikh Sayf al-Adel (may God protect him) if he is present in Khorasan or one of the branches of the group. A number of meetings were held that brought together Sheikh Jowlani and Sheikh Abu Humam with the supervision of the sheikh who heads the committee, and it has been agreed between the two sides on a detailed plan of action, and the sides have signed the agreement. Sheikh Abu Abd al-Karim head of the committee. 1. Sheikh Abu Humam accepts what Sheikh Abu al-Khayr (may God have mercy on him) established previously in that the arms of the commission and all in its hand from possessions are the property of the commission. 2. The brothers in the second side are obliged not to form sectors or open guesthouses, while the commission is obliged to secure specified places for the brothers according to the agreement. 3. The second must not work to weaken the commission or compete with it, and their work should be harmonious and comprehensive with the work of the commission, and the two sides are to cooperate on the basis of piety, taqwa, jihad and supporting the religion. 4. The second side must not accept anyone who has a state of prior enmity with the commission like Liwa al-Aqsa [an Islamic State-aligned splinter from Jund al-Aqsa] and Jund al-Aqsa and the remnants of the Dawla group [Islamic State]. 5. Referring organizational disagreements that arise in future to the sheikh who heads the committee. 6. No one is to transfer from the commission to them or vice versa except according to release of pact from his leadership. 7. The commission is required to arm some of the groups affiliated with the second side, while they work militarily under the cover of the commission and through it. 8. The second side is obliged to stop trying to reach the south and stop any activity there. 9. The two sides are obliged to resort to arbitration in the Shari'i courts spread out in the liberated areas. 10. The second side must not engage in media commentary on the political and Shari'i positions of the commission and the door of mutual advice in secret remains open between the two sides and what is regarded as dubious in law between the two sides from issues is to be referred to the sheikh upon whom there was agreement from the mashayakh of the initiative. In addition to other clauses and details. Note that the initiative 'And conciliation is best' had delegated Sheikh Abu Abd al-Karim (may God protect him) from its side. And we ask God to fulfill best and to reward best all who participated in the contracting of the agreement and bringing about its success. And praise be to God the Lord of the Worlds. 1. 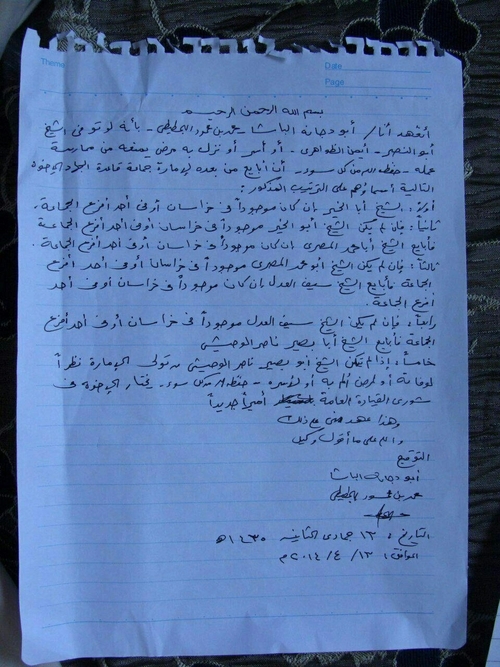 Regarding the breaking of ties, there was the stage of Fatah al-Sham, and it was the stage of the transfer of the ties from public to secret, and it was the stage on which the cadres were consulted, then they claimed that Sheikh Zawahiri had agreed on the transfer from public to secret before the message of Sheikh Zawahiri came in rejection of that and stating that Sheikh Abu al-Khayr does not have the competency in deciding the transfer of allegiance. This is the stage about which the one called al-Ghazi spoke misleadingly. 2. As for the stage of the formation of Hay'at Tahrir al-Sham, they did not consult on it any of the cadres at all, not even Sheikh Abu al-Khayr. And after they announced the commission [Hay'at Tahrir al-Sham] they did not announce that they had broken the ties in a true sense at the time of the announcement, and when they went back to Sheikh Abu al-Khayr to bless the formation of the commission he told them literally to go back to Sheikh Ayman al-Zawahiri. For how could Sheikh Abu al-Khayr agree on a decision on which Jowlani did not consult him? 3. As for the 16 clauses agreement that he mentioned between Sheikh Abu Humam and Jowlani, al-Ghazi has also misled and he did not make clear that the one who demanded its cancellation was Sheikh Jowlani and not Abu Humam. That was so because he wished to benefit from the announcement of the organization [Hurras al-Din] in order that the phantom of classification should be distant from him, and because he desired for the organization to enter into infighting with the commission after Jowlani despaired from the groups that took their ennobled stance regarding Jowlani's defection and the breaking of the ties, rather than participating in the infighting and being a puppet in his hand like others besides them. And the particular of the disagreement of opinion between the Shura and Sheikh Abu Humam- that is something for which the organization is to be commended as the Shura among it is true and real and not a puppet moved by the amir as he wishes or exploited by him to pass through his foolhardy decisions on his soldiers without having them review what is happening from fateful decisions in a most dangerous field of the fields of jihad. And I challenge al-Ghazi to make clear the truth of what has happened regarding an agreement between the defector Jowlani and the secular Turkish government with a stamped document or official statement directed to the soldiers of the commission so that they may know the truth of the agreement that is subordination to the nationalist, secularist Turkish decision-making. 4. 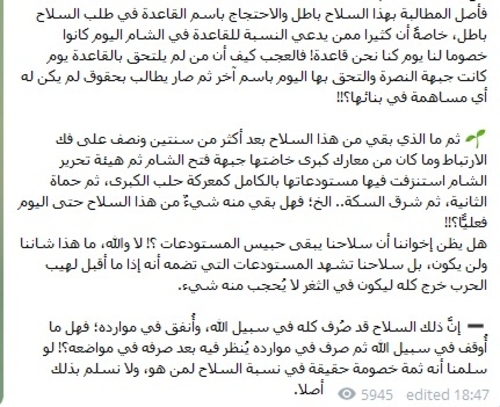 As for the spoils, it is amazing that al-Ghazi says that it is an endowment for jihadi work. For who entrusted you to the endowment of war spoils and by what text precept have you usurped the rights of the mujahideen who have fought in the path of God? This is something stipulated by a clear divine text precept in which there is no doubt, making clear the payments of war spoils, and Jowlani pledged during the allegiance pledge of Suqur al-Izz to him- and the audio recording is present and spread- that he had settled the distribution of war spoils to the mujahideen since that day and it has subsequently become clear that his claims are not true and he has been fickle in that just as he is in the rest of his pledges, among them the allegiance pledge. Then the claim that the weapons were used up in your battles with the regime. Why don't you tell us from where you have your warehouses filled with ammunition and weapons in the north of Syria? From where do you get this? Indeed you are merely misleading. They withdrew the spoils in Sharq al-Sikka and they withdrew the heavy weapons from the brothers and kept the ammunition away from them, and there are the witnesses to that. So your words oh Ghazi are witnessed and upon you is a decree and the outcome is in the hands of God. Also, the spoils are not only the arms that are before you in oppression and enmity against the rights of the mujahideen, but also there are the lands, real estate, possessions, cars and agricultural holdings and other things from the wealth of the ransom of the prisoners that was in the hands of Jabhat al-Nusra and Jabhat Fatah al-Sham. 5. Last but not least, the clear words between us and you to the Rabani 'ulama: you are indeed a party and have claims, and we have claims and truth. And we await the words of judgement on that from the 'ulama who preach the truth. Even if the ruling is against us, we comply with it. And you tested us and it became apparent to the knowledgeable one when the Shari'i judiciary ruled on the case of the child from the case of the French brothers.